If you are redesigning or remodeling your bathroom, consider adding a unique stone sink to switch up the look. 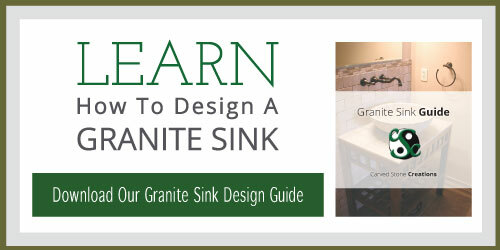 With sink options available in a variety of stone types and colors, you are sure to find the perfect sink design for your bathroom. This sink is hand-carved from black granite. The sink features sleek, modern lines perfect for a contemporary-styled home. The black color of the granite keeps the sink design simple, yet interesting. This vessel sink design is a beautiful option for a contemporary style bathroom. The simple design and high-polish finish are sure to complement your decor. A natural boulder sink offers a unique rustic look for your bathroom. 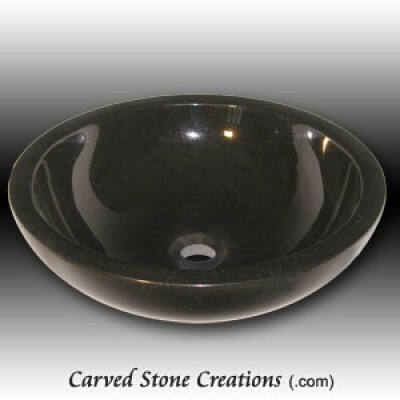 The sink is carved from a boulder and the inside of the bowl is polished to create contrast. View more boulder sinks here. 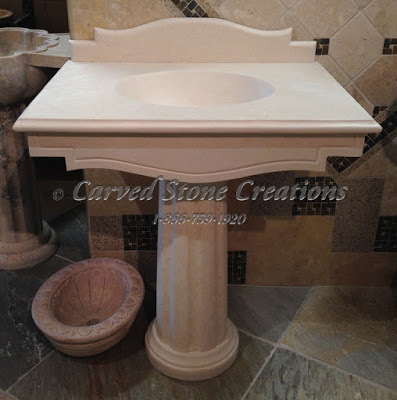 Bring a classic touch to your home with a hand-carved limestone pedestal sink. This sink features classical design motifs on the apron, back splash and column base of the sink. Accent your bathroom decor with the classic vessel sink look. The high-polished marble and unique veining are a timeless compliment for any fine home.